If you’re a chemistry enthusiast and/or huge nerd, you’re in for a treat! 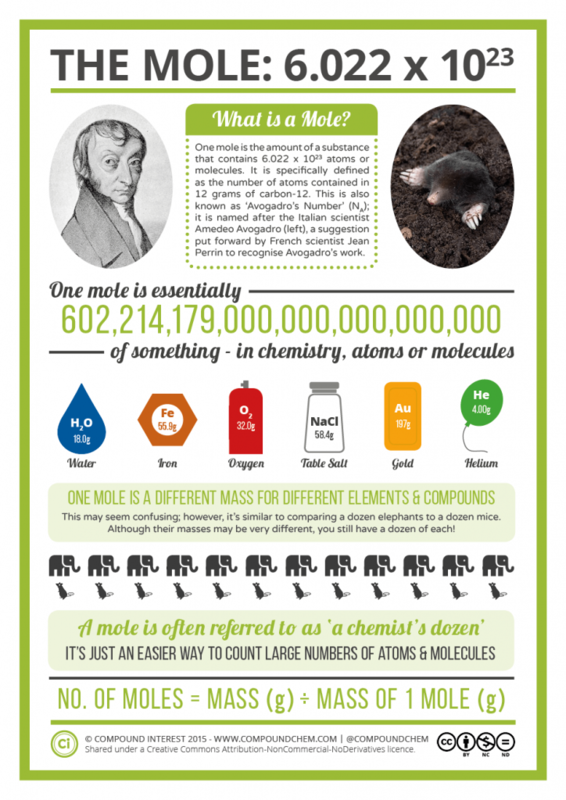 Mole Day, which is an integral part of National Chemistry Week, is the celebration of Avogadro’s Number. You may be asking yourself, “What in the world is Avogadro’s Number? !” As I am no chemistry devotee, I took the time to look this information up for you, dear reader. Avogadro’s Number (or Avogadro’s Constant, if ya fancy), named for famed Italian scientist, Amedeo Avogadro, is the number of molecules in one mole. I understand that you may be shouting “Now, what the heck is a mole? !” at your computer screen. Fear not, dear reader, a mole is but the unit of measurement for amount of substance. Simply put, moles give chemists more accuracy when it comes to determining amounts of substances produced in a given reaction. Okay, maybe that wasn’t so simple, but the mole is a very useful unit of measurement. The measurement is approximately 6.022140857(74)×1023 mol−1 (and yes, I copied and pasted that formula). And so on this October twenty-third in the year two thousand and eighteen, and every October 23rd hereafter, between the hours of 6:02 A.M. and 6:02 P.M., we celebrate the mole. I recommend a visit to the American Chemical Society for more Mole Day activities and crafts to get you in the spirit to celebrate your favorite unit of measurement.